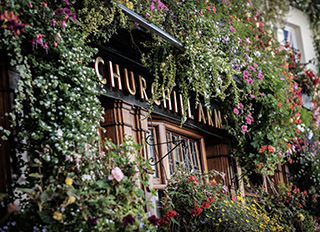 The Churchill Arms, Kensington is famous for a number of reasons – the blooming hanging baskets that cover the exterior in summer and the 70-odd Christmas Trees that replace them during the festive season, plus the Churchill and British Monarchy memorabilia covering the interior. But the most famous feature of the pub was the man behind it all, Gerry O’Brien. Gerry was the manager of The Churchill Arms for 32 years and earlier this year, he retired. Gerry’s departure from Fuller’s undoubtedly deserved a feature in The Griffin, so I set off to The Churchill Arms to interview the man himself. I had never been to The Churchill Arms before, nor had I met Gerry. I had been warned of Gerry’s love to chat, which I discovered wasn’t an understatement, but I don’t think I’ve ever enjoyed listening to someone talk as much as I enjoyed listening to Gerry. While in the pub talking to Gerry and Michael, numerous people came up to Gerry to shake his hand and say farewell. One man came up, shook Gerry’s hand, introduced his young son and explained that The Churchill had been his local for 12 years before he moved back to Canada. He pointed out his wife and daughter and then told us that while pregnant with their daughter, his wife’s waters had broken at the very table we were sat at! There’s no denying the effect Gerry’s had on the pub and those who visited while he was there. Gerry has moved back to Ireland to enjoy his retirement there, although something tells me it won’t be a quiet retirement – it sounds like he’s lined up a few things that will keep him busy! James Keogh is the new manager of The Churchill Arms and it’s definitely worth a visit, it looks amazing, the beer is fresh and the food is great… what more could you ask for?! Gerry has covered the pub in historical artefacts, he’s held Churchill Night (on Churchill’s birthday) in the pub for many years. He’s even been visited by Lady Soames, Churchill’s daughter, who drank a whole bottle of Pol Roger champagne, “I’ve still got the empty bottle she drank from” says Gerry. Gerry took a risk and ended up with the first ‘Thairish’ pub. “I don’t think I’d even heard of Thailand. Definitely hadn’t tried Thai food”. The Thai kitchen has been in the pub for 30 years, with the same family (Pau and co) running it for 28 years. “It’s not what you do, it’s how you do it” – Gerry’s closing line of the interview.